“One-third of those who worked on the pile, including those who came from other states, they’re going to get asbestos cancer—there was that much in the air,” says John Feal. Feal, 49, a 9/11 first responder, advocate and founder of the FealGood Foundation, is speaking about the renewed health crisis, which faces the 410,000 people who were in the vicinity of the former World Trade Center in the days and weeks after the Sept. 11, 2001, attacks. 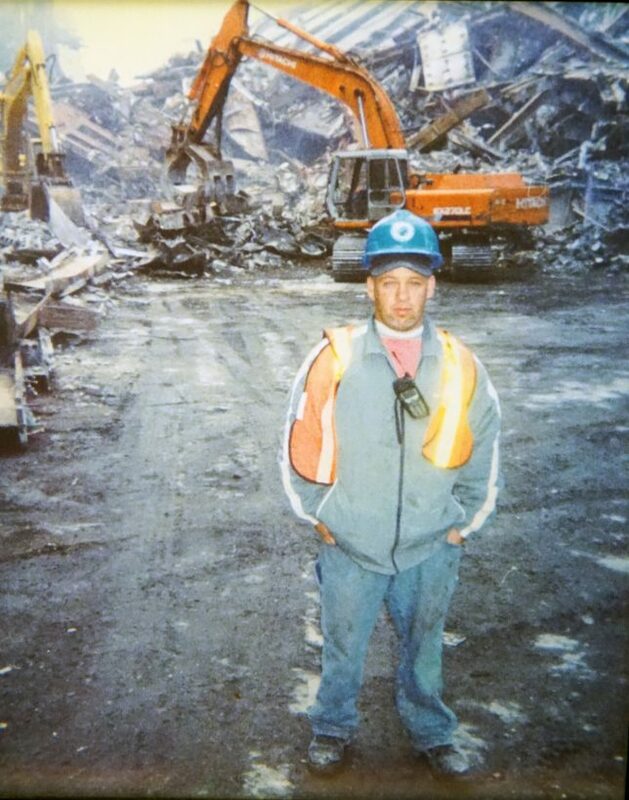 “We’re looking over our shoulder right now…knowing that it takes 15, 20, 25 years to manifest,” says Feal, who lost part of his foot after being injured working at the Trade Center site in September 2001, as a first responder. Feal, who lives with his wife Marzena in Nesconset, New York, created the FealGood Foundation in 2005, to help other World Trade Center responders in need. In 2014, Feal’s foundation began conducting Outreach and Education seminars on behalf of the World Trade Center Health Program (WTCHP). The WTCHP provides health care for individuals who were affected by the Sept. 11, 2001, attacks in New York, Washington, D.C. and Pennsylvania. Enroll responders and survivors into the WTCHP, who were either mentally or physically harmed due to the rescue, recovery or cleanup efforts at the World Trade Center, Pentagon, and Shanksville, Pennsylvania. Educate those who live outside New York because they might not know that they’re eligible for the WTCHP. Explain what documents are needed to show that a responder or survivor was present at any of the sites on Sept. 11, 2001. Below is a picture of the “New York City Disaster Area,” for survivors who lived, worked or attended school in the area highlighted in pink on Sept. 11, 2001, or in the days and months after. Now, 15 years later, the health effects of Sept. 11, 2001, are almost as disabling as they were in the immediate aftermath. Thousands of responders and survivors are battling debilitating 9/11 health-related illnesses while countless others have already died. Feal, says there are over 33,000 members who are being treated for more than one illness and about 5,000 people have a WTCHP certified cancer. He says by 2020-2025, the number of individuals who will ultimately die from a 9/11 related illness will have surpassed the nearly 3,000 lives lost on Sept. 11, 2001. He also says that this number could significantly change. “We haven’t seen the next wave of cancers that are coming, and they’re coming,” says Feal. The “next wave of cancers” is expected within the next few years, cancers like mesothelioma and lymphoma, which can take up to 15 years to develop, are threatening the groups of people who were exposed to the toxins following the collapse of the Twin Towers. Flynn served on the WTCHP’s Scientific/Technical Advisory Committee (STAC), which reviewed scientific and medical evidence to add certain cancers to the List of World Trade Center-Related Health Conditions in February 2012. 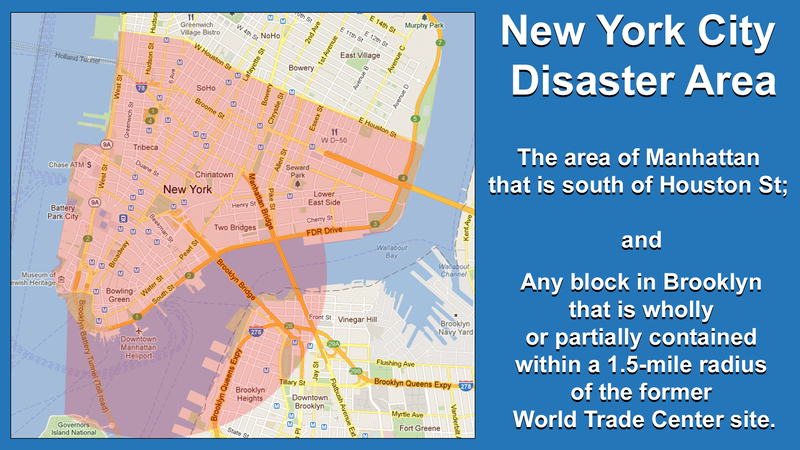 The NRDC reported that 1.2 million tons of building materials drenched the World Trade Center site during its demise. Thousands of gallons of jet fuel ignited a powerful fire, which then emitted toxic gasses into the air. Burning electrical equipment, plastic and other materials discharged extraordinary amounts of dioxin, mercury, and lead and other harmful contaminants into the dust cloud. Three months after the attacks, acrid smoke hovered over Ground Zero and the surrounding neighborhoods. Furthermore, the NRDC said that asbestos, used during the construction of the North Tower for fireproofing steel beams until the 40th floor—anticipating a ban on the material—also filled the air when the buildings came down. Nearly 300-400 tons of asbestos was used in the North Tower. An estimated 410,000 people were exposed to the dust cloud during the rescue, recovery and cleanup efforts [which lasted until May 2002] after the Twin Towers collapsed. That’s according to The World Trade Center Health Registry, a database which follows a group of 71,000 people who were exposed to the disaster in New York City. 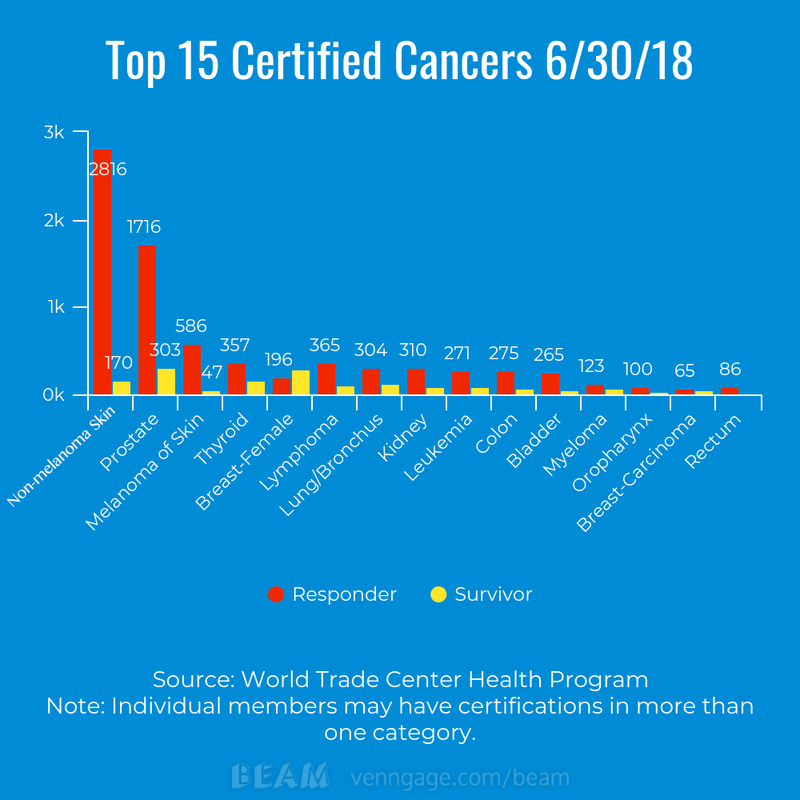 In 2012, 50 cancers including mesothelioma, most commonly caused by asbestos, were added to the List of World Trade Center-Related Health Conditions. Prostate cancer was added in 2013. Flynn says she won’t stop looking for survivors and says, “We want people who are sick—enrolled because that’s where they’ll get the best treatment.” She plans on focusing more on the children from 9/11, who went to Stuyvesant High School, which was three blocks away from the World Trade Center. Feal crisscrosses the country, enrolling new people into the program, which also helps the WTCHP collect data on symptoms. Therefore, when the time comes to add a new illness, there is sufficient evidence. In late April of 2016, Feal returned from Alexandria, Virginia, where he helped enroll 25 people into the WTCHP. Back on Nesconset, Long Island, when you first walk into Feal’s office you can’t help but notice the awards, plaques and Captain America memorabilia that adorns the walls but he’s uncomfortable with the recognition. “Accolades are like the equivalent of a pie-eating contest,” he says. Much of Feal’s recognition is to the James Zadroga 9/11 Health and Compensation Act of 2010. The Zadroga Act provides health care and compensation to responders and survivors who were present at the World Trade Center at the time of the attacks and in the months following the disaster. Feal made over 18 trips to D.C. alone last year with the FealGood Foundation and fellow first responders to lobby Congress to support and reauthorize the Zadroga Act. FealGood Foundation Heads to D.C.
Feal and his boss drove into the city and eventually down to the site, which became known as ‘The Pile,’ to help what was then a rescue effort. “To go in and out of Ground Zero and see thousands of people with pictures of loved ones and them handing you a picture, we knew after a couple of days we weren’t going to find anyone,” he says. Feal says that the scale of devastation and the destruction humbled him. He says he tried to accept it for what it was and that no one was prepared for what they saw on the pile, and he learned not to fear it. 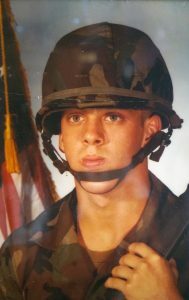 His ability to deal with the horror at the World Trade Center is rooted in the skills he attained when he served in the United States Army’s 101st Airborne Division at age 17, from 1984-1987. 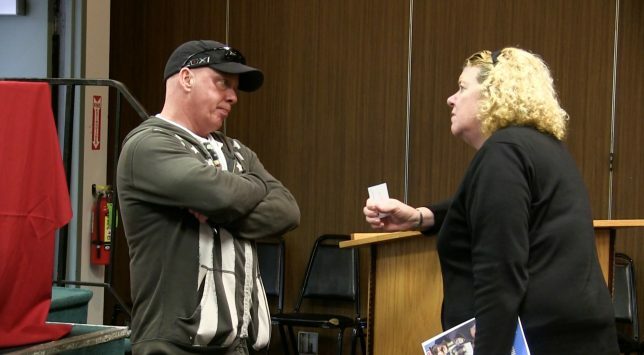 “A lot of 9/11 first responders are post-traumatic, they still cannot come to terms on what they had to deal with and what they saw, your body’s not programmed, your mind’s not programmed to wake up in the morning and see that kind of devastation,” hey says. But Feal soon discovered that he was ineligible for the first September 11th Victim Compensation Fund (VCF) as the fund only covered injuries that occurred within the first 96 hours after the attacks. Feal’s injury occurred at 120 hours. He was barred from the first VCF and filed a personal injury lawsuit, which took nine years to resolve, and he was compensated in 2010. Today, Feal also suffers from other 9/11 ailments like acid reflux, Gastroesophageal Reflux Disease (GERD), post traumatic stress disorder (PTSD), and other physical injuries caused by his foot trauma. Feal says his illnesses pales in comparison to those of other responders and survivors. Feal played a significant role in the effort to make the Zadroga Act permanent in December 2015 and is now focusing on getting more 9/11 illnesses covered by the WTCHP. 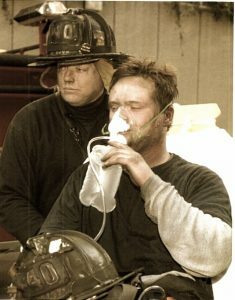 Feal’s efforts included bringing retired and serving firefighters to D.C. to lobby politicians about the ongoing health issues for 9/11 responders and survivors. One of those retired firefighters was Raymond “Ray” Pfeifer, who was diagnosed with stage 4 renal cancer in 2009, which has now metastasized to his brain. He also suffers from diabetes, GERD, and PTSD from his time spent at down on the pile. And that’s what Pfeifer did—even if he wasn’t at 100 percent. He was part of Feal’s team that went to D.C. in November 2015 (see video) to try and convince congressmen and women to support the Zadroga Act. “We were the first soldiers,” Pfeifer said. “The first responders. Nobody said, ‘I’m not going in,’ that was our job.” The job has cost Pfeifer his health, and possibly his life. 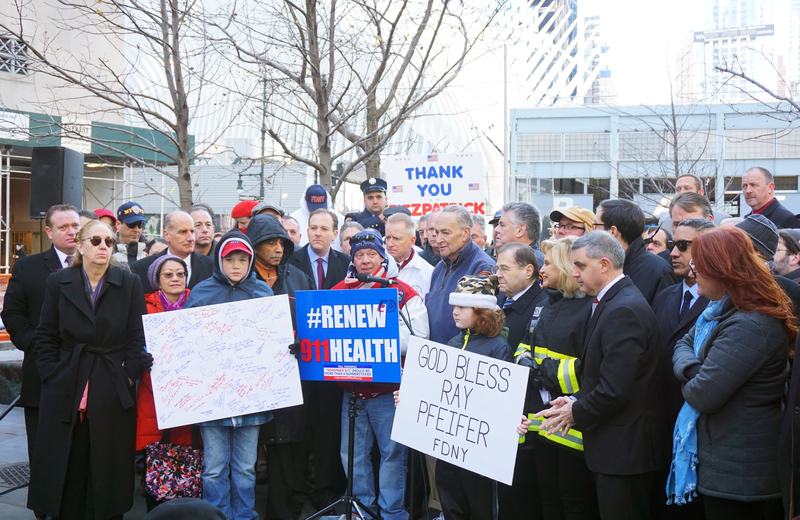 When the Zadroga bill was reauthorized on Dec. 18, 2015, Pfeifer didn’t attend the celebration in D.C. or the victory press conference in New York City the day after. He’d been admitted to the hospital a week before the passing of the bill because of the tumor in his brain. Feal was devastated. He immediately launched a campaign to have Pfeifer’s efforts recognized by the City of New York and, in January 2016, Pfeifer was presented with the key to the city by New York City Mayor Bill de Blasio. Pfeifer died on May 28, 2017. 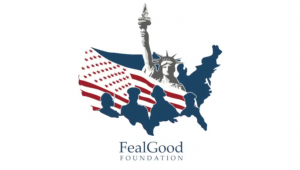 Since its inception, the FealGood Foundation has donated $4 million to pay for everyday necessities first responders may need to survive such as food, medication and utilities. The Foundation raises money through donations, and Feal himself has contributed thousands of dollars. This summer the Foundation will once again join forces with the Long Island Clinical Center of Excellence and host their sixth annual WTC Responder Family Picnic for nearly 800 9/11 responders. The clinic is located in Islandia in Suffolk County and offers monitoring and screening for WTCHP members. Feal also travels along the East Coast visiting different schools discussing 9/11. Feal brings along 9/11 responders so they too can share their stories with younger generations. Recruiting responders and survivors into the WTCHP. Constantly working to get new illnesses covered. Keeping people in the program. Feal says he’s going to focus on getting more people into the program so they can receive health care. To date, Feal has attended 152 funerals for first responders who’ve died from a 9/11 related illness. But he tries to stay focused on the people he can help. Thanks so much! I just want people to get in touch with John Feal, 9/11 first responder and founder of the FealGood Foundation, Kimberly Flynn, founder of Environmental Action, or the World Trade Center Health Program and get the help they may need. Thank you so much! I just hope more people see it and get the help they need! If you’re on a computer, the links for my RSS feed and social media are on the top right by the ‘Useful Links.’ At then end of the article are ways to share the article. If you’re on a phone, everything will be at the bottom. Hopefully that works! If not, let me know and I’ll try and fix it. Thanks for the support!! Please share this article to spread the word!